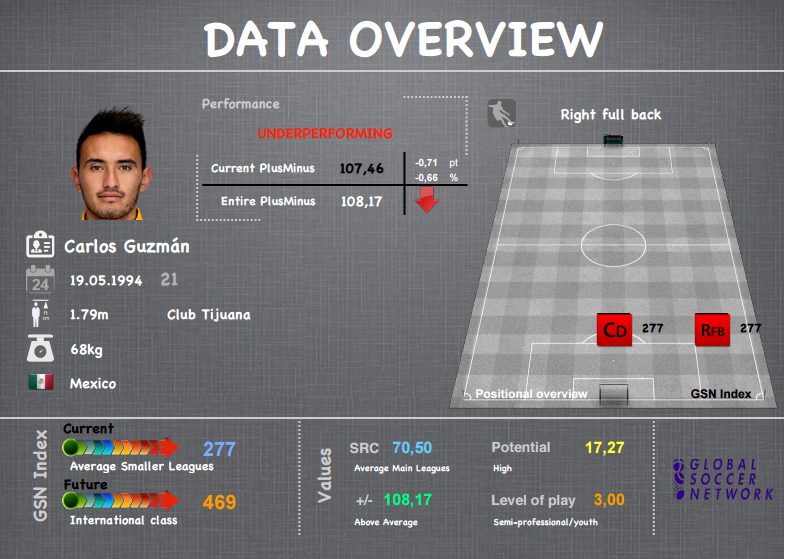 Tom Harrison takes a statistical look at some of the best young players so far of the Liga MX. 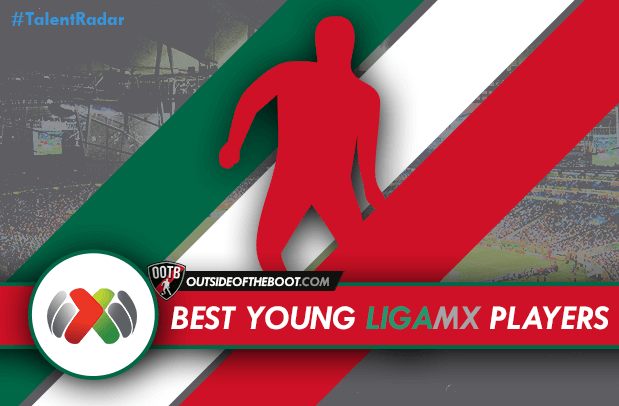 With the Apertura (Opening stage) coming to an end recently, it’s a good time to assess how well the best young players in Liga MX are performing. 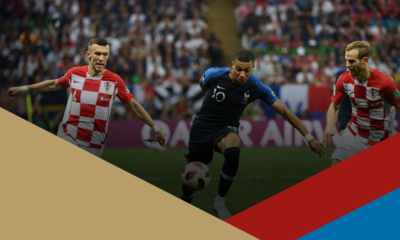 In light of this, I decided to team up with Global Soccer Network (GSN), using their rating system and my knowledge to evaluate top youth talent in Mexico. 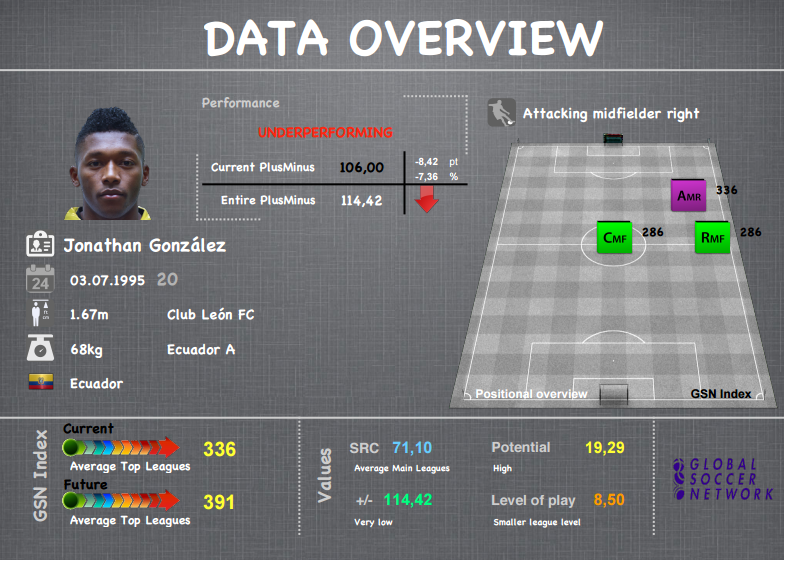 The article will look at the top ten highest rated players under 22 in Liga MX according to the GSN Index. A player that I recently profiled on this website, Edwin Cardona is undoubtedly the best young player in Mexico right now. With ten goals and four assists in 15 games, he’s been one of the stars of the season so far. Out of his ten goals, six have been from outside the box, and Cardona has become well known for scoring golazo’s. However, despite his high level of performances, and the strength of the rest of the squad, his club Monterrey failed to make the play-offs, finishing 9th. Cardona’s performances, both for his club and for his country, Colombia, will surely have attracted attention from sides in Europe, and Monterrey have a huge challenge to keep hold of their flamboyant attacking midfielder over the winter. 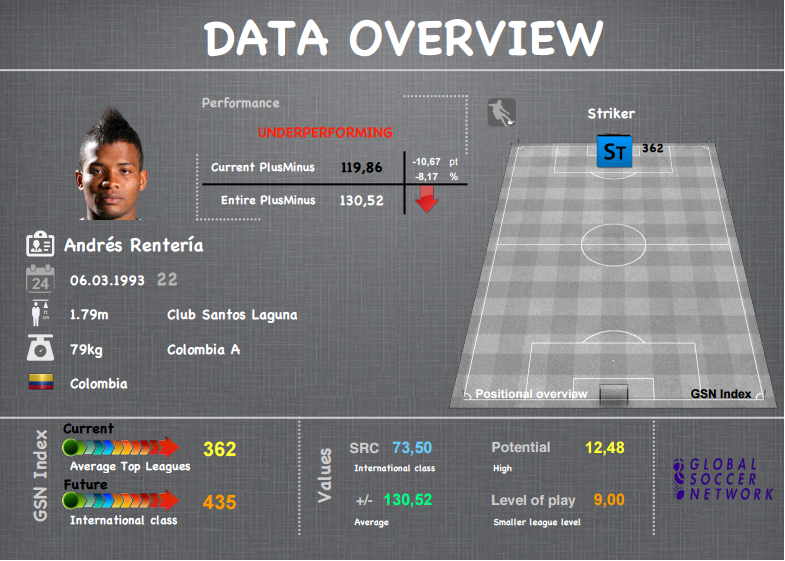 Since joining Santos Laguna in 2013, Andrés Rentería has been one of the best youngsters in Liga MX, but hasn’t developed quite as much as anticipated, and has struggled this season. Going into the Apertura as reigning champions, Santos Laguna have been a huge disappointment, finishing 15th in the first stage of the 15/16 season. Rentería’s performances have mirrored his side, with the striker, who can also operate as an inside forward from left-wing, only scoring twice. Santos will have a new manager in 2016, after Pako Ayésteran left despite only joining in August, and Rentería will hope that both his and his clubs fortunes improve under their new boss. Ecuadorian winger Jonathan González joined then Liga MX side Universidad de Guadalajara at the start of 2015, but moved to León in the summer after UdeG were relegated. The move has so far proved to be a rather poor decision for Speedy González, as he’s often known, with just four starts and five substitute appearances made this season. León, despite a few ups and downs, have had a good competition, finishing 3rd, but González has failed to make much of an impact for La Fiera. Unless first choice wingers Darío Burbano and Elías Hernández move on in the winter transfers window, or injuries are suffered, it’s unlikely that González will receive more playing time in the second half of the season, so a loan move would probably benefit his development. I was extremely excited when Bryan Rabello, one of the most exciting youth talents in the world a few years ago, joined Santos Laguna after failing to make it in Europe. With Santos struggling, the Chilean certainly hasn’t shown his best qualities in Mexico yet, with GSN saying that he’s over performing is due to his very low plus/minus value, but there have been glimpses of sheer class from Rabello. For instance, in the last game of the season, Rabello scored a superb golazo, beating Chivas defenders before smashing the ball into the top corner. 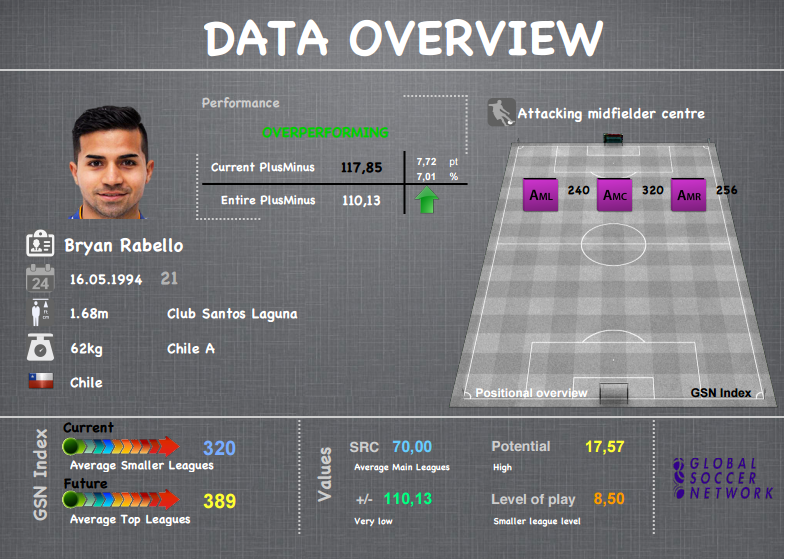 But if Santos are going to improve in the Clausura, and if Rabello’s going to get himself back into Europe, he needs to perform more consistently. Previously used as a right-back the majority of the time, Pachuca manager Diego Alonso has decided to deploy Pizarro in a centre-midfield position for much of this season so far. Performances have been ok, but I’m not sure that the young Mexican is better suited to this role than he is to his original right-back position. Famed for offering plenty of support going forward down the right flank, Pizarro was often ineffective in supporting the Pachuca attack through the middle of the pitch, showing a lack of vision and dribbling ability. I agree with GSN that he does have huge potential though, and it will be interesting to see where he’s used in 2016. 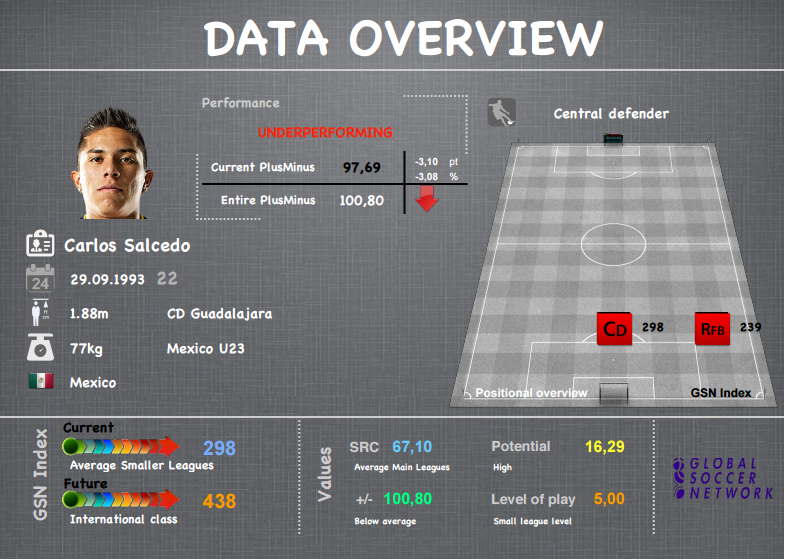 A revelation in last year’s Clausura after re-joining his youth club from MLS side Real Salt Lake, Carlos Salcedo’s had a rather frustrating season so far due to missing a few games through injury and his side Chivas finishing in 13th. The goats from Guadalajara did pick up their first trophy since 2006 though, winning Copa MX, although this competition isn’t well respected in Mexico and Salcedo only appeared in two games during Chivas’ run. On a more positive note, Salcedo received his first Mexico caps this year and many expect to see him lining up for El Tri for many years to come. But with Chivas manager Matías Almeyda, who joined the club in September, favouring high-risk, attacking tactics, Salcedo’s got a huge challenge on his hands if he’s going to limit the amount of goals Chivas concede for the rest of this season. 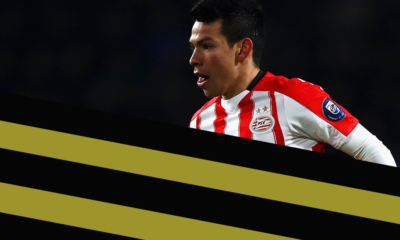 Hirving Chucky Lozano is another player that I’ve written about before on Outside of the Boot, and in that article I criticised Lozano for somewhat regressing this season, becoming far too selfish. Clearly, GSN agrees with me, as they believe the 20 year old is underperforming, despite his basic stats, four goals and three assists in 17 games, suggesting that he isn’t playing too poorly. 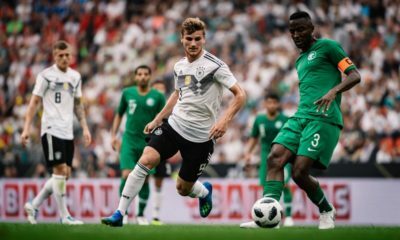 Chucky is still regarded by many Mexico fans as their brightest talent and his talent on the ball is evident for all to see, but he needs to improve his awareness of others on the pitch and more effectively link up with his team mates if his performances are going to improve in the rest of the season. 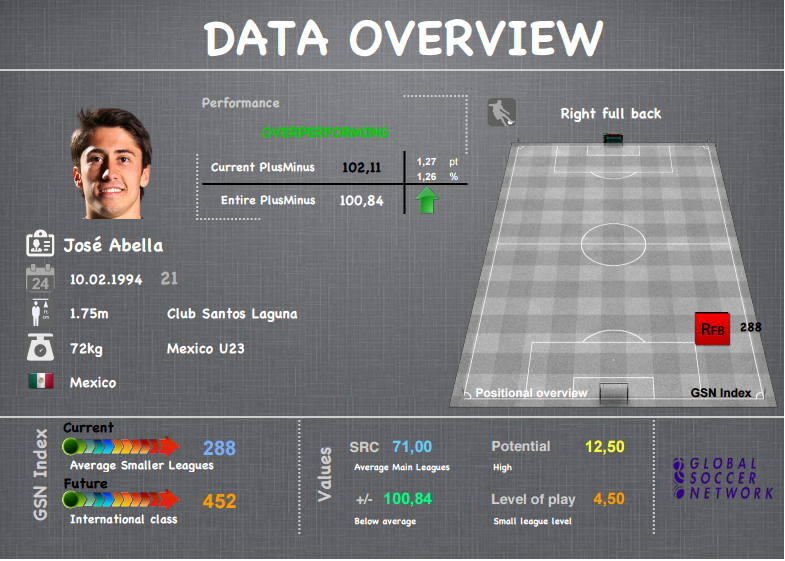 In a disappointing season, the development of right-back José Abella has been one positive for Santos Laguna. The young Mexican has started 16 of Santos’ 17 games this season, and is ranked in the top ten for most tackles in the division. There’s plenty of competition to become the long-term replacement for first-choice Mexico right-back Paul Aguilar, with the likes of Rodolfo Pizarro, Raúl López and José van Rankin around, but Abella has a good chance of winning this battle, although he needs to improve going forward. The 3rd Pachuca player on this list, Erick Gutiérrez is another well-known young Mexican talent. 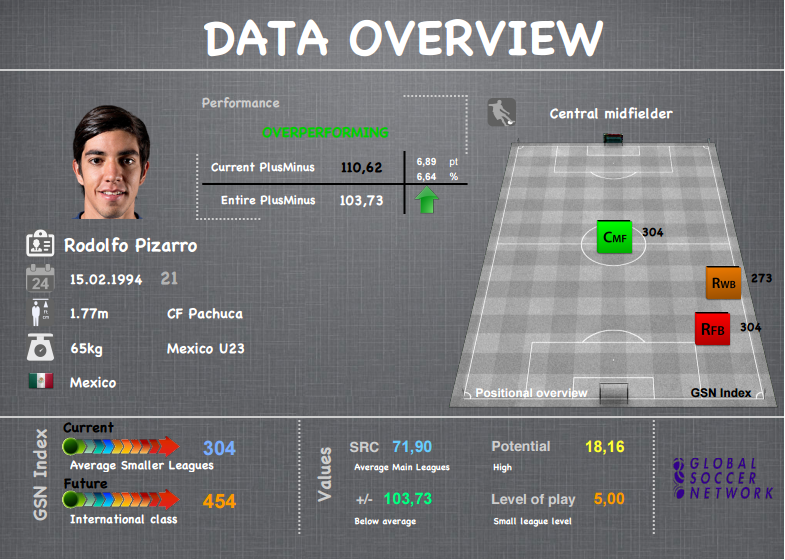 An intelligent, creative midfielder, Gutiérrez is yet to hit the heights of last season. I’m unsure whether this is a change from the man himself, or whether he’s following tactical instructions, but Gutiérrez has been making much less driving runs from deep this season than his did last season. These runs did leave him out of position occasionally but they were so effective at forcing Pachuca up the pitch and taking the opposition’s midfield out of the game. Pachuca as a whole underperformed in the Apertura, missing out on a play-off place, and the likes of Pizarro, Lozano and Gutiérrez will be hoping for a change in their fortunes after the winter break. Defender Carlos Guzmán has failed to nail down a consistent place in the Tijuana squad after moving over from Monarcas Morelia in the summer, starting seven games and coming off the bench a further six times. Finishing second from bottom in the opening section of the Liga MX season, Tijuana have had a very poor season, and Guzmán’s performances have mirrored the majority of his team mates. Ex-Mexico manager Piojo Herrera, sacked for punching a journalist, has been named as Tijuana’s new manager, making them one of the most interesting sides to follow in the new year. Whether Guzmán is part of Herrera’s plans or not remains to be seen. Has Mats Hummels lost his mojo?